Butler forward Isaiah Scribner brings down a rebound in the second quarter of a 73-55 blowout win over North Allegheny Tuesday night. BUTLER TWP — Ethan Morton found his shot — and Butler found a run. Butler's sophomore guard scored 18 points in the third quarter, sinking seven of nine shots — including four treys — to spark the Golden Tornado's 73-55 Section 1-6A boys basketball win over North Allegheny. The victory, coupled with Central Catholic's loss to Pine-Richland, pulled Butler (16-2, 8-2) into a first-place tie in the section with two league games remaining. “I figured we'd be in the mix this year, but to have only two losses at this point of the season ... I'm so proud of these guys,” Butler coach Matt Clement said. The Tornado jumped out to an 18-6 lead in the first five minutes, only to see the Tigers (7-10, 3-6) whittle away at the deficit. North Allegheny took its first and only lead of the night at 28-27 with three minutes left in the first half. Butler scored the final seven points of the half for a six-point edge at intermission. “Usually, I'm looking to set the other guys up for their shots,” Morton said. “Tonight, I felt like I had to (shoot) to get us off on a big run. Morton's fourth trey of the third period gave the Tornado a 56-40 lead. When Tarik Taoufik stuck back an offensive rebound before the buzzer, the lead reached 18 points. Butler scored the first seven points of the fourth quarter to put away the win. The lead peaked at 73-46 with 2:44 to play before North Allegheny scored the game's final nine points. Morton tallied 35 points, 13 rebounds, six assists and six blocked shots for the night. He left the game with 4:33 remaining and his team ahead by 26. 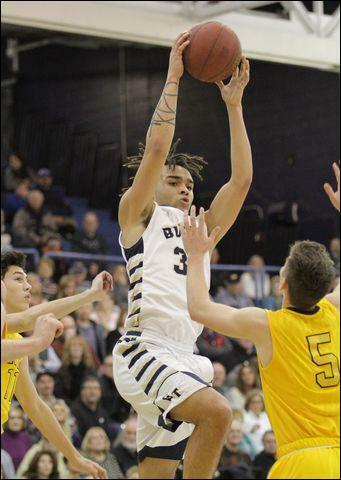 Taoufik scored 10 points for Butler. Luke Michalek had nine points, five assists and three steals, Luke Patten nine points, four assists, four rebounds, four blocked shots and three steals. Zach Johnson, NA's 6-foot-10 center who did not play against Butler in the teams' first meeting, had 16 points and six rebounds for the Tigers. Mike Iuzillino had 16 points and five rebounds. Johnson only scored six points in the second half, but sank all three of his field goal attempts. Ray Sandherr had five assists for the Tigers, who had 16 turnovers to Butler's eight. “It's fun playing at this fast pace with so many good shooters,” Morton said. “I respect North Allegheny's program a lot because of all the success they've had. Butler plays a non-section game at Hampton Friday before a showdown at fellow section lead Central Catholic next Tuesday. Nikko Rankin 1-3 2-2 4, Zach Johnson 8-10 0-2 16, Mike Iuzillino 4-10 5-5 16, Walker Davidson 2-4 0-0 5, Nico Erimias 1-1 1-2 3, Curtis Aiken 1-7 -0-0 3, Ray Sandherr 0-2 0-0 0, Stephen Humphries 1-1 0-0 2, Anthony Hattrup 3-4 0-1 6. Totals: 21-42 8-12 55. Luke Michalek 4-11 0-0 9, John Michalek 1-2 0-0 2, Doug Kostelansky 0-0 0-0 0, Mattix Clement 1-5 0-0 3, Tarik Taoufik 5-5 0-0 10, Luke Patten 4-7 0-0 9, Mason Montag 0-0 0-0 0, Ethan Morton 12-19 6-7 35, Dom Schmidt 1-2 1-2 3, Isaiah Scribner 0-0 2-2 2. Totals: 28-51 9-11 73.